This is the extraordinary sequence of composers selected by Marino Formenti for his solo piano cycle Kurtág’s Ghosts, which examines how major composers from the fourteenth to the twentieth century have influenced the Hungarian composer György Kurtág. Formenti has performed the seamless cycle of seventy compositions live to considerable acclaim, and it is now available as a 2 CD set from the Vienna-based label Kairos. A typical Kurtág’s Ghosts sequence is 46 seconds of Kurtág's Hommage à Stockhausen closely followed by 56 seconds of Stockhausen (Klavierstücke nr. 2) and 94 seconds of Messiaen (Ile de Feu 1), tailed by Kurtág's 75 second ...humble regard sur Olivier Messiaen. Clearly this is much more than the random output of an iPod in shuffle mode; Marino Formenti links the seventy short pieces together to form a logical and coherent single work. The result is a resounding success in every way. Kurtág's pianistic miniatures shine even more brightly when juxtaposed with the works that inspired them. Formenti's pianistic technique is formidable, the engineers of ORF Vienna have captured some of the best piano sound I have heard for a longtime, and the beautifully presented full price CDs are accompanied by an illuminating interview with the pianist. It is such an outstanding release I will even forgive the unattractive ECM-style cover seen above. Last month I asked the question '... what is the Matthew Passion, or any other piece of music?' Kurtág’s Ghosts raises many questions related to this. Is it a sequence of seventy individual performances of works by nineteen different composers, or is it a single new work by Marino Formenti? There is also the question as to what artistic justification there is for extracting, for example, just 90 seconds from The Well-Tempered Clavier? I have always opposed the practice of breaking down complete works (e.g. Holst's The Planets) into audience-friendly samples (Jupiter). But Kurtág’s Ghosts has made me realise that, in the right context, the sum of the parts can be greater than the whole. This thought-provoking double CD has led me to question my own preconceptions, and a webcast project inspired by Marino Formenti's shuffling is under discussion. Watch this path. * The Kairos website has audio samples. 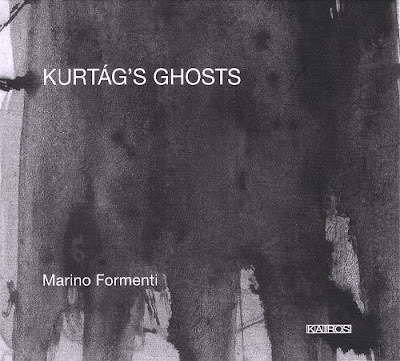 There are several excellent YouTube clips of Marino Formenti playing Kurtág’s Ghosts, including the one below. A miniature celebration of György Kurtág here.